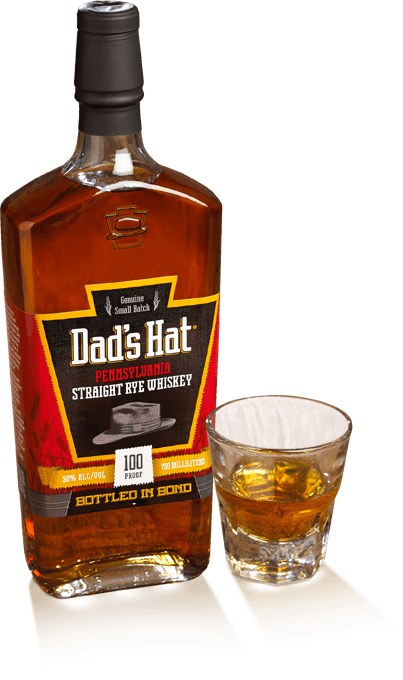 Our rarest rye whiskey ever, Dad’s Hat Bonded Straight Rye is available only at the distillery in limited release. While fully mature at four years of aging, this whiskey is destined to delight rye-lovers everywhere with multiple layers of intense spice rye is known for. Due to a growing problem with counterfeit whiskey, the U.S. Congress passed the Bottled-in-Bond Act of 1897. As a result, strict quality standards were established for a whiskey to wear the exclusive “Bottled in Bond” designation. “Bonded” whiskey must be at least four years old, aged in new, charred oak barrels, by one distiller at one distillery, and bottled at 100 proof. Only spirits produced in the United States may be designated as bonded. The nose is spicy and herbal, with the later a mixture of eucalyptus and mint. A drop of earthy, plum-like sweetness and a pinch of pine needles rounds things out. spicy and herbal in just about equal measures… quite balanced, and makes for a pleasant, easy drinking whiskey.